The Old Spice man commercials transcended advertising and bled right into content. Though it’s a relatively new idea, the phrase, “We’re all publishers now” already has become somewhat of a cliché. These brands and companies don't need anyone else to get their message out to their customers anymore." Back? See what I mean? More than a full page of results with that exact phrasing. While it seems very democratizing, and it is, what many don’t realize is that “we” doesn’t refer only to individual bloggers. Brands are publishers, too, providing their own content and bypassing many of the old routes they used to use to get the word out. 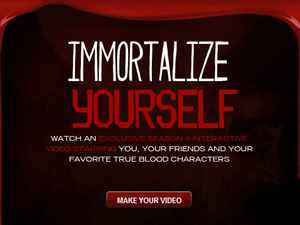 When “True Blood” was getting ready to premiere its fourth season, the usual press releases and preview copies went out, but the show’s biggest splash was on Facebook, through an app called Immortalize that created a custom video for each user, integrating them and their friends into a show scene filmed just for the app. To promote ‘True Blood’s’ season 4, HBO’s best advertising wasn’t advertising at all. It was creating interactive content for fans. Once people started posting the video in their streams, it took off. Or take Mint.com. The personal finance startup was operating on a shoestring in 2008. It smartly focused on building up content on-site — articles, infographics — not advertising Mint, but providing actual information and data useful to its users. The content got shared, buzz was built, and in no small part due to that marketing approach, Mint was acquired in late 2009 by Intuit for $170 million. The idea of branded content is not really new, but it is kind of new that it’s being done well. In their own way, advertisements are branded content, but their message and goal were abundantly clear: Buy our stuff. Content today? Not quite as clear. And it is neither bad nor good — it just is. Some of the content is horrid. Some is quite excellent or entertaining. Some are claiming infographics have jumped the shark. While there’s some validity to that, there are still many visualizations out there that are quite excellent. Infographics has become a catch-all phrase for visualizations of data or concepts. As mentioned above, Mint.com pioneered in using these to build traction. 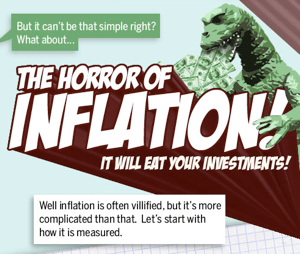 An excellent example of an infographic that isn’t really a graphic: “A Visual Guide to Inflation.” Mint is a consumer site, and many of its users may not really understand the mechanics of inflation. By presenting the information with both images and text, Mint is making it simpler to understand. And it’s providing a useful service to its users. From Mint.com’s infographic on inflation. Let’s get real — part of the goal here is for others to pick up the infographic and run it on their sites, and to link back to Mint. On the Internet, a quality link is worth its weight in SEO. But Mint is still considering the needs of its users and providing content that makes sense. Sure, sure, the commercials were hilarious and well-done. But they were still advertisements. There have always been some that caught on and became a part of the public discourse. Wendy’s “Where’s the Beef?” in the 1980s, Budweiser’s “Whasssuuup?” at the turn of this century. What made the Old Spice video campaign so much more was the series of videos that they did afterward. Making a huge number of super-quick videos responding to dozens of Twitter users — famous and not — was a genius move, ensuring that there would be tremendous sharing and viewing of these. Even the most random responses got hundreds of thousands of views. And on every single one of these videos, the words “Old Spice” were featured prominently in the title. 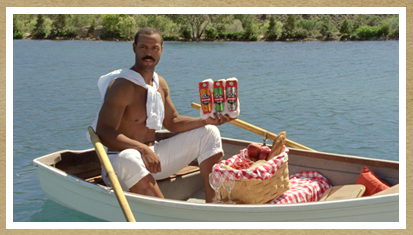 Isaiah Mustafa, the main character, didn’t have to even mention Old Spice in any of the videos if it didn’t fit. The company created videos that everyone wanted to watch and share and provided a much longer shelf life than just the commercials themselves. Photo-sharing apps are all the rage with kids these days. Burberry’s Instagram feed is popular enough that photos, like this one, get thousands of likes. 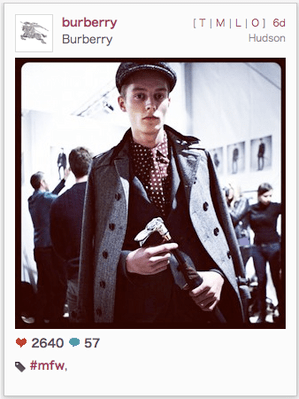 The most popular among them is Instagram, and few have used it as effectively as Burberry. The iconic British fashion brand has more than 157,000 followers. The brand’s average photos get thousands of likes and dozens of comments. They’re a mix between shots from fashion shows, photos of London, and close-up detail of products. People follow Burberry because they’re getting a behind-the-scenes look and the images are always stunning. The quality of the photos is top-notch, and they’re not just all about the brand. They all relate to the brand, however — few things are more London than Burberry, in an iconic sense. And you will catch sight of that signature plaid every now and again, lest you forget whose account you’re following. In all honesty, this isn’t really being done very well by many places. A lot of emphasis is being put on visual content, not as much on helpful articles that provide value to readers/customers/users. Content farms have had a lot to do with that, I believe, but smaller shops such as Contently are rising up to become the anti-farm and provide solid blog posts. In both cases, these articles were useful to their core audience. They weren’t flashy or showy, but they had actual utility. Those aren’t blog posts that are going to draw someone to their blog, most likely, but they are articles that might keep someone there for a while longer. Did I mention we’re all publishers now? So what does all this mean for the future of the traditional content producers? The newspapers, books, TV stations, radio stations, et al? It just means that we all need to make sure we’re providing some sort of value to our readers. That value can be informative, entertaining or instructional. But whatever it is, it’s competing with ever-improving content created by companies with deep pockets. These brands and companies don’t need anyone else to get their message out to their customers anymore. For the so-called content creators — writers, photographers and videographers — it actually means more opportunity, not less. Amy Vernon spent nearly 20 years as a professional daily newspaper journalist before the Great Newspaper Culling of 2008. She has since been featured in articles in a variety of publications and sites, including the New York Times, Venture Beat, Hybrid Mom, and OurBlook. She’s an inaugural inductee of the New Jersey Social Media Hall of Fame and has spoken at many conferences and events, including SXSW Interactive (this March), Columbia Journalism’s Social Media Weekend, Reynolds Journalism Institute’s The Engagement Metric, ROFL Con II and Affiliate Summit East. She is married and has two young sons. Amy also is known as the Bacon Queen of the Internet. She will be speaking on the topic of the ubiquitous publisher at the upcoming South by Southwest festival in March.